When deciding to emigrate from the UK we initially planned to move to Auckland - we'd lived in Parnell for about a year in 2004/5 pre kids and had loved it... But with vastly increased prices and a lot more traffic since we'd lived there last, a 2 year old and a 6 month old baby in tow plus a sister who was living in Hamilton, it just made more sense to make a home in the Waikato. We found it surprising that Hamilton seemed to have a less than favourable reputation amongst people who didn't live here and we kept getting asked (especially by Aucklanders): Why here? We've been here for exactly four years now and it has in fact been a wonderful early childhood period for our girls. We've discovered some wonderful places to visit, play, explore and picnic, we've found lots of lovely cafes, eateries and interesting shops and we've met some amazing people along the way - some of which will be lifelong friends. Despite how much the city has grown in the last few years, we've decided that Hamilton is actually still a very well kept secret! Hamilton is a very family friendly city with fantastic parks and green spaces, lots of indoor & outdoor activities, brilliant schools, great places to eat, a museum, various art galleries, safe suburbs where children still play on the streets together, numerous amazing events throughout the year (Balloons over Waikato has got to be our favourite annual event!) and above all else, truly lovely, lovely people. Happy Hamilton memories at the gardens, lake, river, parks, museum, libraries and Garden Place. As we pack our belongings once again to move on to our next adventure in Tauranga, we wanted to say a huge THANK YOU to everyone in Hamilton who has made our life here that much easier. It has been a wonderful four years and we are a little sad at the life we are leaving behind, but we will be back throughout the year to visit our favourite places. Chapel Hill is a Christian Kindergarten that provides excellent quality education which helps prepare children for school. It is a very safe, nurturing, stimulating and exciting environment for them where they are challenged physically, creatively as well as spiritually to become wondrous learners and to grow as thoughtful little individuals. As a kindergarten they are extremely community focused and their involvement with parents, families and local places helps strengthen the relationships all round. The open door policy means you are welcome to pop in for a visit at any time or stay and get creative with your child if you like. There are multiple nations represented at CHK which makes for a wonderfully mixed, global environment for kids to grow up in, knowing that they are all the same. The different cultural days, national holidays and shared lunches are all testament to the fact that the staff respect and honour the values, customs and traditions of all families and are inclusive of all children regardless of gender, race, culture, religion or social background. They have a fabulous safe and secure outdoor area for the kids to play, explore, discover and test out new skills as well as shady spots where they can quietly participate in more creative activities in the open air. There are various little adventure trails, a veggie garden and the latest addition - 5 chickens: Maisy, Daisy, Rosie, Bessie & Susie! Inside there are several areas for different activities... Crafting and activity stations, a very extensive play kitchen with lots of lovely handmade felt items, a dress up area, story corner, play dough table and a mat room with fish tanks, bricks, blocks, train sets, toy animals, musical instruments, science experiment equipment and all kinds of other treasures! Another new addition to the kindy family of pets is a turtle - now called Frankie. The walls and ceilings display an ever evolving array of truly amazing artwork and crafts that the children have made, creating a visual feast for both children and parents. It is lovely for them to be able to take pride in their achievements by having them displayed on the walls, or to work together in a little team on a large shared project. What fun learning to be had! Whatever topics are currently being explored, they are always supported with lots of artwork and creativity. It seems a prerequisite that all of the teachers are extremely artistic and creative! Some of the pieces that have come home have been absolutely frame or display worthy - I can hardly believe the amount of treasures we have around the house from our time at CHK, thanks guys! We have participated in two art auctions in the last few years and some of the pieces that the teachers and children created together, as well as each child's individual artwork were truly phenomenal. I truly believe that inspiring creativity in children and getting them involved artistically is one of the best possible gifts they can get in life. It teaches so many other skills, helps with dexterity and coordination, opens up their minds and helps them to solve other problems in creative ways. Just a small selection of some of the amazing artwork and creative techniques being taught at CHK! Chapel Hill wouldn't be the special place it is without the truly amazing, wonderfully creative, thoughtful and inspiring teachers and staff that run it. Some of them have become like family to us over the years and we are so overwhelmingly grateful for everything they have done for both of our daughters, as well as for us as a family. We have happy memories and beautiful artwork that we will always treasure. Our girls have absolutely loved their years at their "home away from home" and I can hardly believe how lucky they've been to have both spent their preschool years at CHK. I couldn't have wished for anything better for them! We thank you for your kindness, we thank you for your creativity and we thank you from the very bottom of our hearts for nurturing, inspiring and above all loving our children. We will miss you all dearly but will always remember you fondly. We ventured there last weekend (just before I broke my knee) after rave recommendations from numerous friends to go and check it out – both for ourselves and to blog about. I'd seen inside the building during the construction phase and we had been keen to visit, but being mid-winter and not traditionally ice cream season yet, we simply hadn't quite got round to it. It was a rainy Saturday afternoon when we visited, Grey Street seemed eerily quiet and so we foolishly assumed we'd have the place to ourselves. By the time we'd finished our ice creams however, the quirky little shop was completely packed and we left just to clear some room for the next people to sit down! The queue snaked right around the main part of the shop, proving that ice cream is good for all weather and that people were coming from all parts of town to sample the delights on offer at Duck Island. The best ice cream we've had in ages! Simon - always happy to try something new - doesn't usually like liquorice but he gave it a go. He enjoyed the ice cream but found the actually pieces a bit overpowering, perfect for a liquorice lover though and I'm sure it would be a first choice for both my Dad and my brother. The girls both wolfed theirs down with lots of yummy noises and as for mine, it was absolutely perfect for me! Just the right combination of sweet, tangy, fruity and refreshing without being sickly - I have been craving some more ever since!! For those that don't know, Duck Island is a spin off venture of Chim choo ree restaurant in Hamilton (which we have yet to visit and review) and both premises are owned and run by Cam, Kim and Morgan. The fascination with making ice cream began in the kitchen of their restaurant, where they have always made their own ice cream for the dessert menu. The experimentation with numerous different flavour combinations has been something they've really enjoyed and they felt there was a gap in the market for a shop that created interesting flavoured ice creams. Inspired by similar ice cream parlours in America, they had been wanting to open up an ice cream shop for a year or so but were just waiting for the right space to become available. It seems that Duck Island was well worth the wait, as their corner setting on the edge of the park will almost guarantee a line around the block come summer, I have no doubt! All the ice creams as well as everything else they serve - from sauces and sodas to cookies and other delights - are all made on site. As a rule their ice creams don't have eggs in them (which can be an allergy concern for some) and of the 18 or so flavours in the cabinet at any time, there would probably only be one with egg yolk in it. There are also always 4-5 dairy free ice creams available, usually coconut milk based or straight fruit sorbets, meaning that really everyone is catered for! They like to use seasonal ingredients so whatever is currently in season will be found in the ice cream cabinet... Just don't expect boring old flavours, most of them have their own little twist on the ordinary! They are really looking forward to the arrival of summer and you can be sure there will be lots of berry and stone fruit flavours to sample. Delicious! Since opening their doors three months ago they have had an overwhelmingly positive response and they are extremely grateful to the wonderful people of Hamilton who have come out in winter to buy ice cream. I wish you all the best with the shop guys, congratulations on a fantastic first three months and thank you for the delicious flavours and friendly service. We will be back soon for more! - Once I can hobble in that is. However, when our living situation changed at the end of March and we found ourselves just up the road from here, we were admittedly quite excited to have such a great place to walk to. During our moving day we took an hour out to wander down and check it out for lunch and ended up leaving with a box of treats for later that afternoon. Yum! Ever since then we have been loyal customers and have regularly stopped in either on the way to or back from the park, after school as a little treat (we've even done homework there) or on a quiet weekend when we just wanted to get out for a little walk and winter warmer. It's also been a great central meeting place for work discussions. We love the mix of urban, industrial decor and the converted warehouse look is really inviting. It's a cool mix of faux red brick walls, polished concrete floors, warm earthy tones, hanging shelves filled with a plethora of bottles, plants, trinkets & treasures and mismatched industrial lighting. The comfy booths and quirky stools & chairs encourage you to sit a while and there's a magazine rack filled with the latest items from the news-stand just to ensure you do. Every time we've been in there are always plenty of people enjoying their time there! The staff are all really friendly, the drinks are always good, there's a cabinet full of a revolving array of lovely treats and even the gluten-free are well catered for (Lucy thanks you!). In July Coffee Culture ran a fabulous event called Winterfest, which consisted of 31 different challenges to inspire you to get outside, embrace the cooler weather, try new things and have some fun. The girls absolutely loved the idea and we completed about 24 of the 31 I think, which was great fun - we shall look out for it again next year. Unfortunately we weren't the lucky winners of the grand prize Fiji trip, but we did enjoy the free coffee and cake vouchers we won as well as the winter warmer pack - Thank you guys! So if you're looking for a place to take the kids for a fluffy or hot chocolate, want a nice spot to catch up with a friend, or simply fancy treating yourself to half an hour off and a quiet sit, I would fully recommend Coffee Culture. There's a kids play corner if that helps and I'm sure you'll find something to enjoy. Plus they are open late nights till 10pm from Wednesday to Saturday! Well worth a little trip out. Thank you to all the staff there for friendly service and for always making us feel welcome. Little fans of Coffee Culture - and since it's Lemon Month here we had to try the lemon cheesecake! Hamilton Gardens has got to be, hands down, our most favourite place in this city and I cannot rave about it or recommend it highly enough. In the almost four years since we have been here we have spent more days and hours there than anywhere else and we have enjoyed it regardless of the season or weather. Everybody that has visited us here has been treated to a day out at The Gardens and they have all gone away impressed... So I wanted to share it with more of you! It is a visual feast and a sensory delight all year round with so much to see, smell, hear, take in and appreciate. So much more than just a botanical garden, it is a treasure trove of forms, patterns, geometric shapes, architectural beauty, interesting sculptures, colour, cultural diversity and historical information. Unsurprising that it was voted International Garden of the year last year! There are so many different parts to explore and you could go every day for a week and choose a whole different experience each time. Our girls certainly do depending on the weather, the time of day and their current mood and it is a fun adventure every time. In Spring The Gardens are bursting at the seams with beautiful blossoms and the weather is perfect for long lazy days spent picnicking, wandering and just enjoying the visual overload. Summers are full of gloriously bright colours and those hot sunny months - where too much walking around can be tiresome -are perfect for spending time in the Rose Garden, sitting under the shade of the trees or one of the many gazebos, enjoying a breakfast picnic in the sunshine or an early evening get-together with friends. As Autumn rolls around you can see the season changing before your very eyes and this is a wonderful time to explore the woodlands, go on a nature trail and kick up some leaves. The mild Winter here is a blessing for the Gardens and with the abundance of evergreen trees and the variety of plants that are suited to the different seasons, it still remains a lovely, colourful place to visit during the cooler months. Wrap a scarf around you, pop on a hat and just enjoy being outside amongst all the greenery. And even if it's raining, there are the Victorian greenhouses to explore, or just bring an umbrella and splash in the puddles – your kids will love you for it! 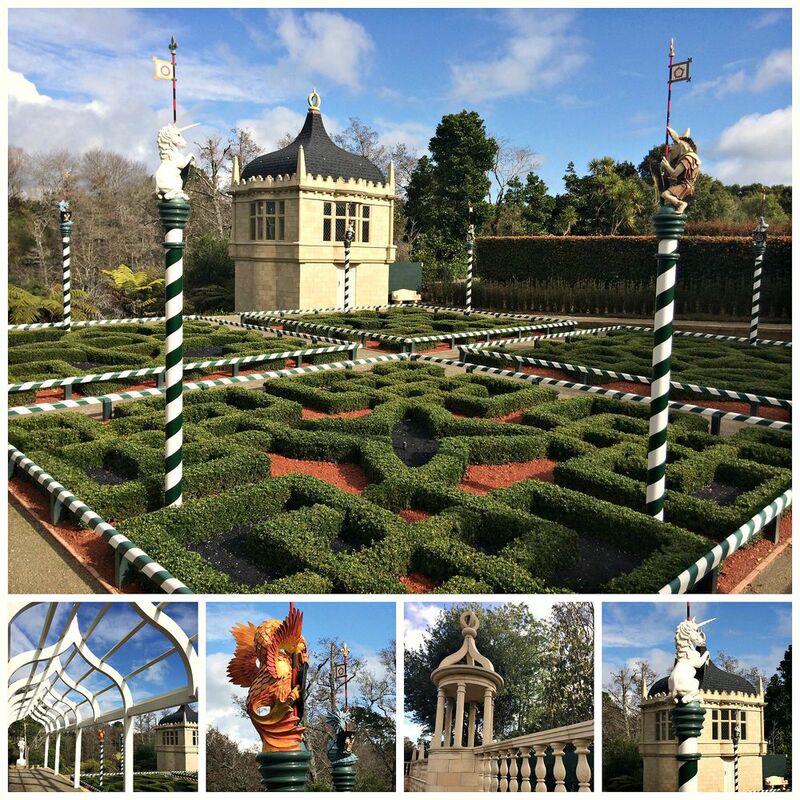 Hamilton Gardens is made up of numerous themed gardens and collections that are all beautiful to explore and photograph at different times of the year. You can click on the name links to see a full description of each one and learn more. All the children's favourite spot in summer! An amazing walled garden filled with a constantly revolving array of fruits and vegetables - yum! The Fantasy Collection comprises of gardens that explore the different aspects of fantasy, from botanical, artistic and historical to cultural representations. These are the ones we have watched develop over the past few years and there are very exciting new gardens planned within this collection. Around the other side of the Gardens, the Cultivar Collection features some of the larger areas dedicated to specific plants and themes. Cultural events are hosted on these gardens throughout the year that will appeal to all ages and are well worth coming along to. I will no doubt follow this post up with visuals of these gardens when the weather improves, but will leave you with the links for now. We do however have a special affinity with the Rose Garden... Can you tell?? After all that exploring, you can sit and unwind at the Café (if you can find a seat!) and enjoy watching the ducks on Turtle Lake or the hive of activity on the central lawn and before you leave, don’t forget to check out the amazing wood sculpture wall inside the Pavillion. Plus there's even a playpark for the kids! The pumpkin and scarecrow festival - 2 of Arabella & Lucy's favourite fun events! I encourage you all to make the most of Hamilton Gardens if you're here or add it to your must see list if you are heading to this part of the world. Take your time and just enjoy exploring all the different parts, there is beauty to discover around every corner and it is good medicine for all ages! Do you have a favourite spot that has become a part of your everyday life? Any recommendations for places we should visit one day?